INTERPRETATIONS’ main theme is a collection of songs not home-brewed by Richard Carpenter, but rather the group’s interpretation of others’ material. Initially released in the UK and Canada in October of 1994, the album was re-worked for a US release in 1995, both claiming to be part of a 25th anniversary celebration. 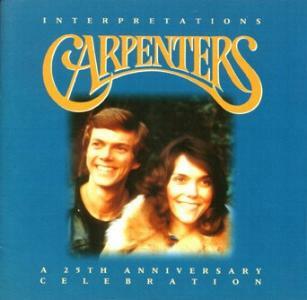 The reason for Carpenters fans to rejoice with this release is the inclusion of three “new” tracks. “Without A Song”, an a capella performance from the TV show MUSIC, MUSIC, MUSIC, “From This Moment On”, a studio recording from the same TV show (this arrangement heard earlier on the live Palladium release), and a finished-off recording of a long-forgotten work-lead from Karen of “Tryin’ To Get the Feeling Again,” originally recorded for the HORIZON sessions, mislabeled, thought lost, and found on the “Only Yesterday” multi-track master tape being used for the karaoke release. The “Without A Song” segment is nice, but sounds unfinished, which it is. As part of the TV special, Karen & Rich performed this a capella introduction which was then completed by guests Ella Fitzgerald and John Davidson. A completed version, recorded entirely by Karen & Richard singing the others’ parts was apparently done in the studio at the time, but saved for release on AS TIME GOES BY. The real treat here is the recording of “Tryin’ To Get The Feeling Again,” the David Pomeranz song familiar as a Barry Manilow release. 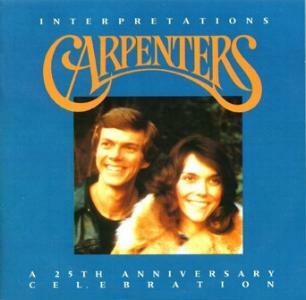 The Carpenters’ arrangement uses the full version of the song as originally written by Pomeranz. A close listen will reveal the sound of a page turning between verses, as this was only a work lead. It remains a mystery as to why this excellent song and arrangement wasn’t chosen for HORIZON. It has been pointed out that for the 1995 version of INTERPRETATIONS, further work was done on Karen’s lead (demo) vocal, eliminating some mouth sounds inherent with close microphone techniques. The UK/Canada release of the album (540 251-20), arrived in stores in 1994 featured 21 tracks, as opposed to the now-common US version with 16 tracks. The longer track list includes “Sing”, “Where Do I Go From Here”, “Desperado”, “Ticket To Ride”, “If I Had You”, “Please Mr. Postman”, and “You’re The One” while not including “”I Believe You” and “Reason To Believe.” In 1999, for the 30th Anniversary on the A&M label, the UK released INTERPRETATIONS in the Remastered Classics series (as “Digitally Remastered”). Though it had the black label with the red printing like others in the series, there’s no sonic difference between it and the 1994 version. One other difference between the two releases is that “From This Moment On” was remixed for the US release with a re-recording of Richard’s piano part in stereo. The earlier version was taken straight from the mono recording for the TV special (although never used in the show). Most of the other tracks here appear in remixed form. Exceptions are “Solitaire”, “When It’s Gone”, “I Believe You”, and “Little Girl Blue” which are the original mixes. Two “improvements” happened between the original UK/Canada release and the US release. Richard re-did his piano part for “From This Moment On” in stereo for the US release. There was also a bit of tweaking of “Tryin’ To Get The Feelin’ Again” where some of Karen’s close-mic’ed mouth sounds were eliminated. The UK also got to hear the improvements on “Tryin’…” as their CD single and 45, released later in 1994 (December), used the new updated tweaks. INTERPRETATIONS also served as the title to a video release the same year, which featured somewhat different titles from the album.